Sopas is a Filipino word that literally means soup. It usually includes macaroni. It is similar with the traditional dish in Italy that is sometimes served with beans. In this Filipino variation, it is a soup made with pasta (usually elbow macaroni), flaked chicken, vegetables, and milk. Boil 4 cups of water in a pot. Add the chicken breasts. Cover and cook in medium heat for 15 to 18 minutes. Add more water if needed. Separate the chicken from the water. Let the chicken cool down. Shred the chicken. Set both water and shredded chicken aside. Heat oil in a soup pot. Sauté the garlic until golden brown. Add onion, shredded chicken, hotdog and carrots. Sauté for 1 minute. Pour the water used to boil the chicken. Add milk, sugar, salt, pepper. Stir, cover and let boil. Put the elbow macaroni in the pot and let it simmer for 10 minutes or until the noodles are completely cooked and soup starts to thickens. Add the cabbage. Stir, cover and cook for 2 minutes. Add more water if needed. 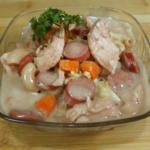 Watch our video to learn how to cook Sopas (Creamy Chicken Macaroni Soup). You can topped it with parsley and add hard boiled egg before serving. Don’t let it sit too long to avoid the pasta from absorbing the soup. This will result to bloated and soggy macaroni.